The VW Vanagon, is a people carrier that traces its roots to the legendary VW Transporter (Kombi) of the 1950s. After World War II, Ben Pon, a Dutch Volkswagen importer came up with the idea of creating a van based on the VW Beetle. It is believed that his inspiration came from visiting the VW factory in Wolfsburg, where he saw stripped down Beetles being used to transport parts around the factory. Pon’s idea captured the attention of the Volkswagen chief executive Heinz Nordoff, in 1948. 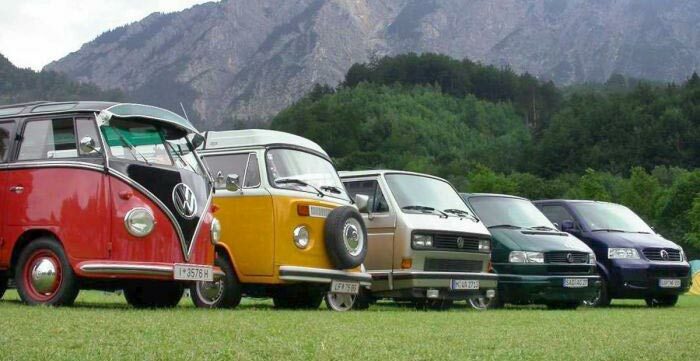 The following year, the VW van was born, released to the world at the Geneva Motor Show. This first VW van was known as a Type 2, the Type 1 being the original Beetle. The simplicity and versatility of the VW van allowed it to be produced in many different forms for many different roles, these included milk floats, ambulances, flatbed pick-ups, delivery vans, buses and of course it’s most popular form as a camper van. Over the years the van evolved with the major changes happening in the engine. In 1983, VW launched the Type 3 van, which was the first water cooled van. It was simply the old engine with a water jacket on it. This 1985 van was among the last in the series of 1.9l water cooled vans as in 1986 VW launched a new 2.1l water cooled engine that helped address the under powering issue that plagues this van. Nevertheless, the spirit of the Transporter van still lives in this one and I intend to restore it to its rightful glory.